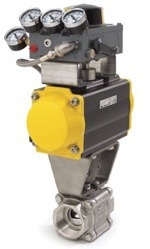 SonicTorque - Sonic Torque® actuators are proving effective in a wide variety of industries including manufacturing, chemical processing, paper and pulp, petroleum, power generation, food processing, and more. They're readily available for distribution in the U.S., Latin America, Europe, Asia, and the Middle East. All assembly of Sonic Torque® Actuators takes place at the company's plant located at its Northlake, IL headquarters. Actuators can be custom made to varying specifications, design modifications, and special needs. The company is noted for its technical ability, service by an experienced staff of trained specialists, technical support, and readily available inventory that allows for prompt delivery while eliminating long lead times.